Temple of Artemis - The Temple of Artemis (also known as the Artemision) was dedicated to the Greek goddess of fertility and was one of the Seven Wonders of the Ancient World. It was unique among the wonders in that no fewer than three temples stood on the site, with several other shrines likely built before those. Over the lifespan of the Artemision, Ephesus (where the temple was built) grew from a tiny Greek colony into a major metropolitan city. While we know who built the later temples, the earlier structures are shrouded in myth. Herodotus attributes the founding of Ephesus to the race of warrior women known as Amazons, who worshiped Artemis and built the first temple to her. But the hallowed nature of the site is even older. Centuries earlier the earth was struck by "fire from the gods", designating it as holy ground. The area probably was hit by a meteorite which gave rise to its sacred status. Returning to the historical realm, a modest temple was known to be in place when King Croesus captured Ephesus in 550 B.C. ; but it was destroyed during the battle. Croesus, known to be a religious man, vowed to rebuild it. Besides being religious, he was also incredibly wealthy. In fact, in ancient times the name Croesus was synonymous with wealth ("rich as Croesus" was the saying). He didn't just build a temple similar to the one destroyed, he built it huge. It was 300 ft (91m) long, 150 ft (46m) wide and four times the area of the previous one. The massive roof was supported by a hundred columns that were 40 ft (13m) high. 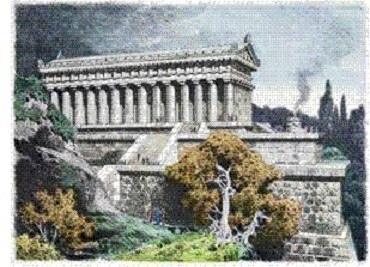 This new temple stood for two hundred years when a man named Herostratus decided he wanted to make name for himself. So he burned it to the ground. The Ephesians were so outraged they had Herostatus executed, and made speaking his name a crime punishable by death. In later times the legend grew that the temple was destroyed on the same night Alexander the Great was born, and for this reason, Artemis was too busy overseeing the safe delivery of the future world conqueror to protect her own building. Once again, it was rebuilt and, believe it or not, was even larger than the one Croesus built. This final temple was 450 ft (137m) long, 225 ft (69m) wide and 60 ft (18m) high and supported by 127 columns. It was destroyed by the Goths in 268 A.D., never again to be rebuilt.